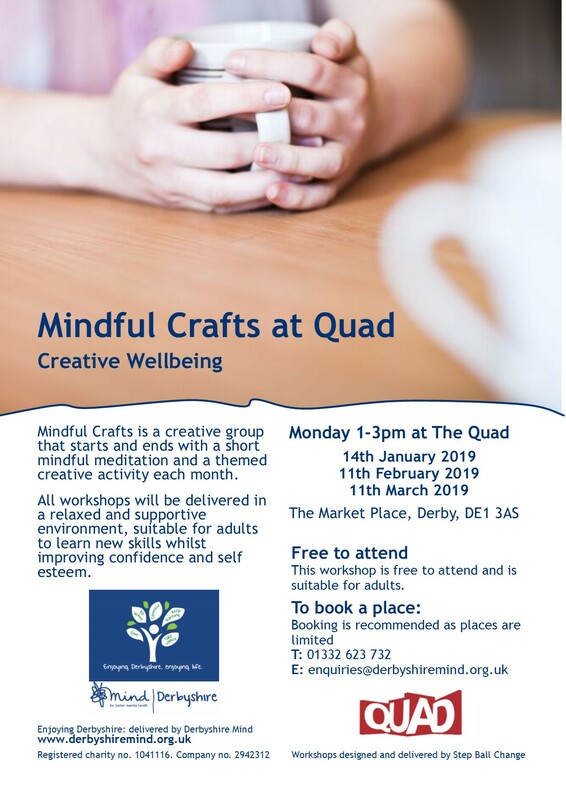 Mindful Crafts is a creative group taking place 1-3pm on the second Monday of each month during Spring 2019 at Quad, on the Market Place, Derby. Each month there will be a different theme. All workshops will be delivered in a relaxed and supportive environment, suitable for adults to learn new skills whilst improving confidence and self esteem. These workshops are free to attend and all materials are provided on the day, just bring yourself! You are welcome to bring a bottle of water with you, with other refreshments are available from the on-site coffee shop. Delivered in partnership with Quad as part of their Year of Wellbeing, Derbyshire Mind’s Enjoying Derbyshire project and Step Ball Change. Each session is set out to be welcoming and supportive, with different themes. If you’re not sure about trying something out, please ask a member of staff for more information about what it is to help you decide what you would like to participate in. Please be aware that the January session will take place in a room upstairs, rather than the usual room downstairs. Lifts are available.